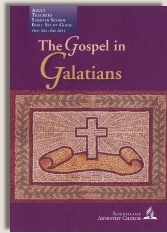 Commentary on "The Gospel in Galatians"
Commentary on "Justification by Faith Alone"
Day two: Sunday - The Question of "Justification"
Day six: Thursday - Does Faith Promote Sin? Copyright 2011 BibleStudiesForAdventists.com. All rights reserved. Revised October 16, 2011. This website is published by Life Assurance Ministries, Glendale, Arizona, USA, the publisher of Proclamation! Magazine. Contact email: BibleStudiesForAdventists@gmail.com.